The state indicator reports are available in State Assessment & Demographics for 2015-16. To generate the reports, select State from the indicators section on the left of the screen. Check the reports you wish to run and select generate. Please note: The State Indicator reports are based solely on the accuracy and validity of the current student data files submitted to DMAC. In light of the unique circumstances of the 2015-2016 testing year, Regional Partners and Districts/Charters should be cautious in making assumptions based on these reports. 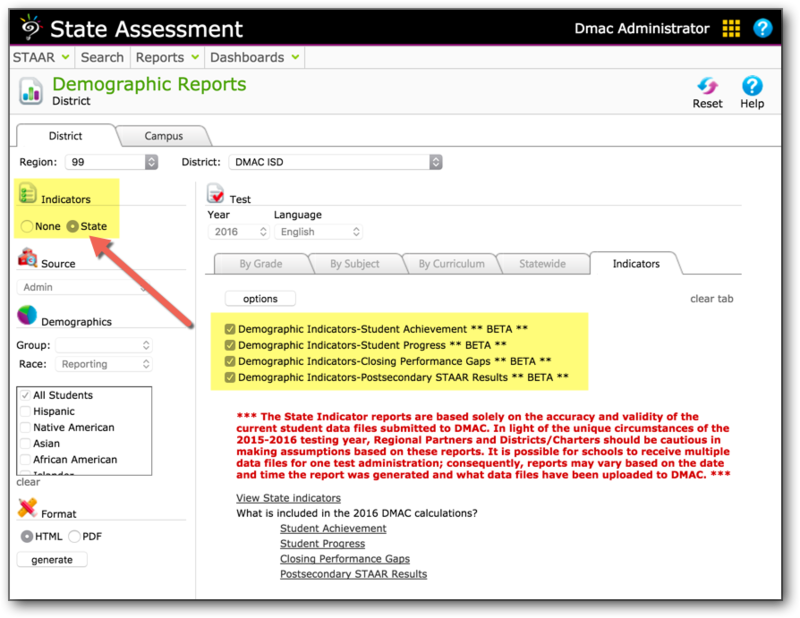 It is possible for schools to receive multiple data files for one test administration; consequently, reports may vary based on the date and time the report was generated and what data files have been uploaded to DMAC.